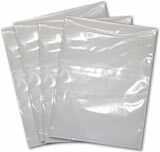 250 Clear poly bags, use to Keep contents clean, dry and visible. Light duty use. 250 Clear poly bags, use to Keep contents clean, dry and visible. Medium duty use. 100 Clear poly bags, use to Keep contents clean, dry and visible. Heavy duty use. 100 Clear poly bags, use to Keep contents clean, dry and visible. Medium duty use - 250 gauge. 50 Clear poly bags, use to Keep contents clean, dry and visible. Heavy duty use - 500 gauge.